A fortnight remains before Mumbai votes. 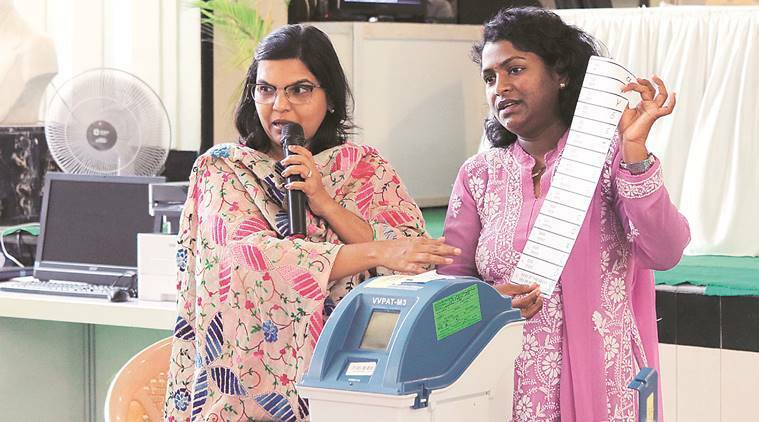 Tucked in a leafy Bandra East lane near suburban Collector’s office, a community hall, often used for marriages, has been converted into a war room for the Election Commission (EC). From this Assembly constituency office, 300 government officials will man the voting process for 2.4 lakh people in 263 polling booths. Across the city, there are at least 36 such Assembly constituency offices under six parliamentary seats where over 10,000 government officials are preparing polling booths for 94 lakh people to vote. These offices have been set up in schools like Antonio D’Silva in Dadar, Ismail Yusuf College in Andheri East to government halls across the island city. Across Maharashtra, there are 97,640 polling booths. On a stage at far end of the community hall, 60 zonal officials huddle around deputy collector Santosh Thitte, as he discusses the detailed schedule in the run up to the April 29 Lok Sabha elections. On Friday, following last day for withdrawal of nomination, Thitte placed an order for over 200 additional ballot units. Each ballot unit can store maximum 16 candidates’ names, and in Bandra East, where he is in-charge, there are 20 candidates contesting from Mumbai North Central. White party tent clothes separates each team to create a makeshift office. In one, a team is going through the voters’ list, in another, a team is preparing the postal ballot form 12. A group of officials are watching the recordings of campaign rallies to find Model Code violations in yet another such office. Four teams — flying squad, static surveillance, accounting and video viewing — are on constant look out for any Model Code of Conduct violations. Each team is further divided into four more teams. The flying squad, with over 144 teams in Mumbai, remains on the road the entire day responding promptly to complaints of violations. “We are supposed to shoot videos if we find liquor or cash distribution. Some times we stand at signals, stopping vehicles to inspect them,” an officer said. The static surveillance team video shoots all political rallies. The video viewing team notes licence number of vehicles, number of people, banners and speeches delivered by candidates. The accounting department checks the expenditure in each rally by candidates and whether there are violations, like excessive spending. Even on a Sunday, the entire team is out working from 9 am, while rallies usually start until 10-11 am. Back in the constituency office, in a corner, an official is making calls to differently-abled voters to inform them about the transportation facilities on the polling day. There are 303 differently-abled voters registered in the constituency. Another team of 60 zonal officials report to this office every day after 3 pm. They are in-charge of 43 schools where polling will be held. This time, 15 facilities, including creche for children, transportation and ramp for differently-abled and shelter for queued voters will be provided apart from basic drinking water and toilet provision. “They make notes and inform us of what additional infrastructure is required,” deputy collector Thitte says. In a sealed ‘strong room’ adjacent to the community hall, Swati Savalkar, an engineer in MHADA, has been roped in by the EC to look after 311 control units, 311 ballot units, and 350 voter-verified paper audit trail machines. It is guarded by three armed police officers at all times. “Today we went to Bandra family court with the entire voting unit to sensitise people about voting,” she says. By next week, when new ballot units arrive, Savarkar will be involved in a 60-member team to prepare electronic voting machines (EVMs). The team would first delete all data of any previous voting, check batteries, test them, put in paper roll and check if printer is working, load names of new candidates, and conduct mock voting drill multiple times. “Our job will only be finished once the EVMs are returned to the strongroom on the night of April 29,” another officer says. For suburban deputy collector, Sonali Muley, creating infrastructure to vote is not enough. “April 29 is going to be a long weekend. We are afraid voters might travel. We have put up announcements at airports, stations and with airways to encourage people to exercise their right to vote,” Muley says.